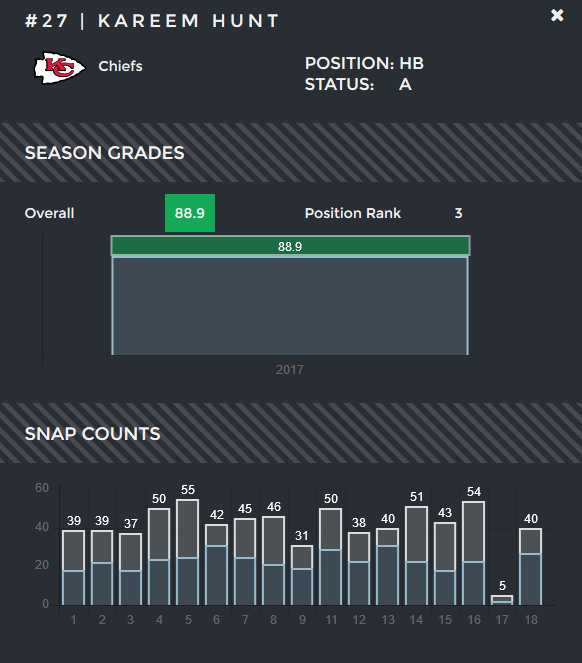 PFF has come a long way over the course of its existence, now supplying data to all 32 NFL teams as well as becoming a dominant force in the fantasy space. 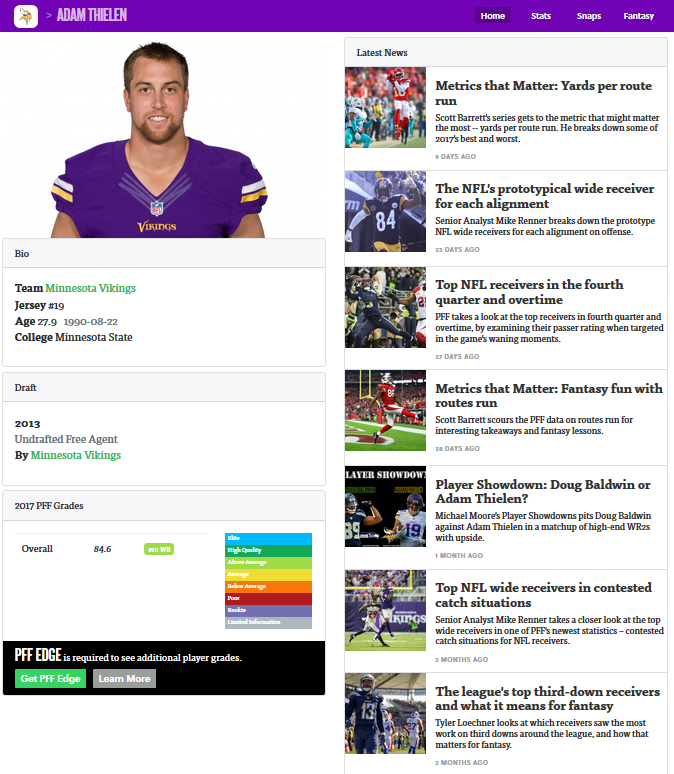 I’ve been a PFF subscriber since well before I started writing fantasy articles, and it’s the first and only site I’ve paid for. Yet, as strong as our offering was back then, nothing can compare to the value we’re offering today. Don’t believe me? Keep reading. If you’re not already a subscriber, you can purchase a subscription here. If you’re not yet sold, or are already a subscriber looking to get the most out of your subscription, this article will serve as a walkthrough, showing you why PFF should be your one-stop resource for all things fantasy football. With all of this content at your disposal, and from so many different fantasy experts with various specialties, there’s no reason you shouldn’t dominate your fantasy league this year. And who knows, maybe you can even profit a bit more than that from our recommendations and analysis. In January of 2017, our very own Joey Cartolano won $75,000 on DraftKings using the exact DFS lineup he recommended in his article that week. At PFF, we have a team of experts who spend roughly 20,000 man-hours grading every player, at every position, on every play, in every game during the season. You can read more about our grading process here. If you’re a skeptic, I implore you to watch this video from Dallas O-line coach Paul Alexander. Our grades will not only help you settle arguments over whether Player X was better than Player Y, but for fantasy football, our grades can also help you identify breakout candidates before the rest of the fantasy world. For instance, I rostered Doug Baldwin in all of my dynasty leagues before his 2015 breakout solely because he graded out top-25 in his three previous qualifying seasons. Our grades can also help you navigate matchups on a week-to-week basis, spot regression candidates, or let you know when it’s time to drop (or add or trade for) a specific player. My own Metrics that Matter series is in the middle of using our grades to analyze quarterbacks, running backs, wide receivers, and tight ends with an eye on the 2018 fantasy season. Similarly, our snap counts will help you determine whether a specific player’s role is growing or diminishing. For running backs, this is especially useful. Our snap counts also helped me discover one of my favorite stats of the offseason — last year, Jameis Winston averaged 306.9 yards per game in games he played on at least 50 percent of his team’s snaps. For perspective, 306.9 yards per game would have led the position last year by 20.8. 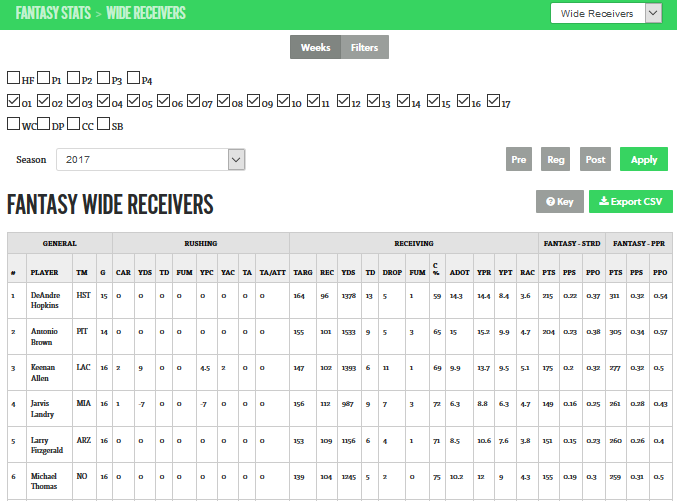 Our player profile pages allow you to effortlessly track every player on your fantasy team or watch list. This page includes current grades, stats, snaps, fantasy scoring, as well as all recent news and articles related to these players. Our projections are calculated by Jeff Ratcliffe, who is the only fantasy analyst to rank top-15 in the FantasyPros ranking contest in each of the past seven seasons. Our projections work on both a season-long and week-to-week-basis and are customizable to your specific league, whether that be, standard, PPR, 0.5 PPR, IDP, or DFS. Last season, we were the only site to have three rankers finish inside the top-20 in the FantasyPros ranking contest, including yours truly (#humblebrag). We offer overall and positional rankings on a week-to-week-basis for PPR, standard, and IDP leagues. (Ratcliffe ranked first in the FantasyPros ranking contest for IDP last year.) On a season-long basis we offer rankings for PPR, standard, 0.5 PPR, 2QB, best ball, dynasty, dynasty 2QB, and IDP. What’s a fantasy subscription without great stats? Luckily for you, we offer the most in-depth fantasy stats in the industry. Our historical fantasy stats date back to the 2007 season, are sortable, exportable to Excel, and can be customized by week(s) including the preseason and postseason. This offering includes all of your more basic stats as well as more advanced metrics such as fantasy points per dropback, average depth of target, fantasy points per opportunity, fantasy points per snap, yards after the catch, tackles avoided, and more. Available positions include quarterbacks, running backs, wide receivers, tight ends, flex-eligible players, kickers, team defense, linebackers, defensive line, and defensive backs. When doing research, I spend a great bulk of my time on this page trying to uncover the best fantasy-relevant metrics. Doug Baldwin has never finished a season better than ninth at the position in fantasy points per game but he ranks behind only Antonio Brown in total fantasy points since Week 10 of 2015. Over the past two seasons Dak Prescott trails only Aaron Rodgers in fantasy points per dropback and would have averaged 1.8 fantasy points per game more than Russell Wilson if he totaled the same amount of dropbacks per game. Both of these stats were calculated using our fantasy stats page. Do you want to know where we had every draft-eligible prospect ranked in the 2018 NFL Draft? Our 2018 NFL Draft Guide is 516 pages of 200-plus scouting profiles and signature stats for the 2018 draft class and includes our big board and positional rankings. Do you want to know where, why, and how we ranked every quarterback following the 2017 NFL season? Our 2018 QB Annual guide is 352 pages consisting of in-depth analysis and PFF exclusive metrics for 46 NFL quarterbacks from the 2017 season. Were you considering purchasing a fantasy draft guide for the 2018 season? 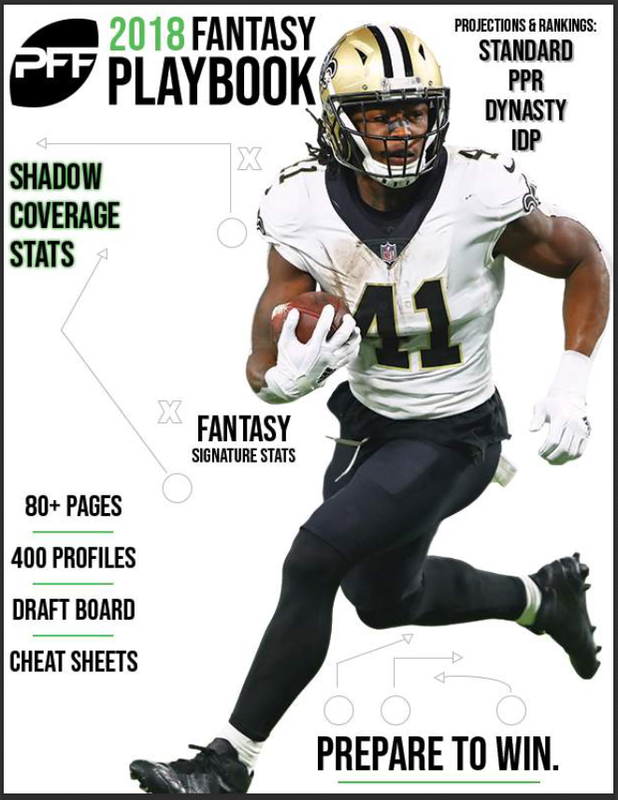 There’s no need to look anywhere else – we have our subscribers covered with the 2018 Fantasy Playbook. Click here for a complete explanation of what you’ll get be getting from this 79-page work of art. 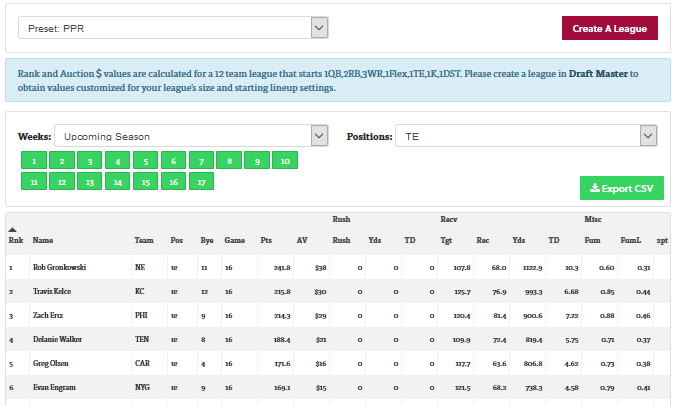 Our DraftMaster tool allows you to import your league settings to gain access to customized (based on your league settings) rankings, tiered cheat sheets, and auction prices. 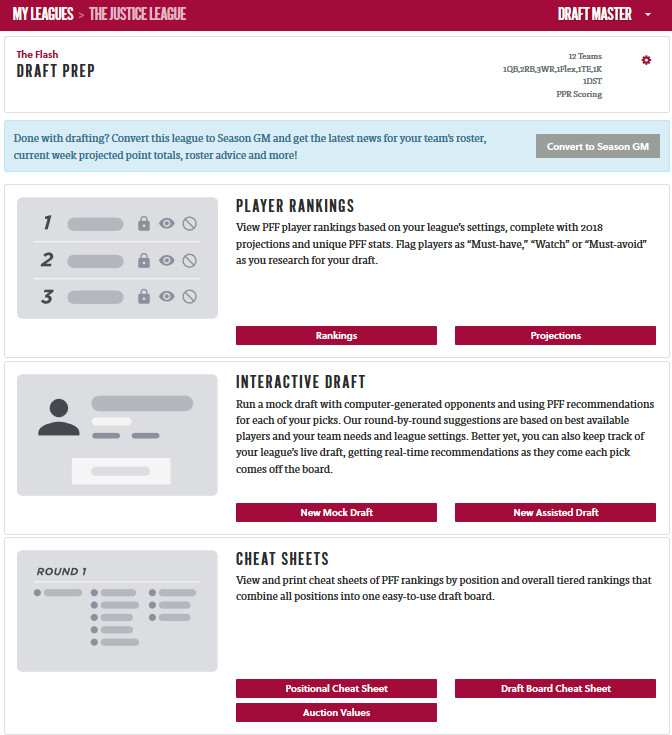 Within the DraftMaster tool you can also run an interactive mock draft with round-by-round suggestions to help you pick the best available players in real-time based on your team needs and league settings. Our Season GM tool offers similar tools but is focused on what you can do during the season and after your draft. After importing your league settings, we’ll provide you with customized waiver wire recommendations and player comparisons based on the specific scoring system within your league. What first led me to purchase a PFF subscription so many years ago? How did I know Julio Jones would have “a DFS slate-busting” game in Week 12 of last season (when he scored over 50 fantasy points)? The answer to both questions would be our WR vs. CB Matchup Chart. 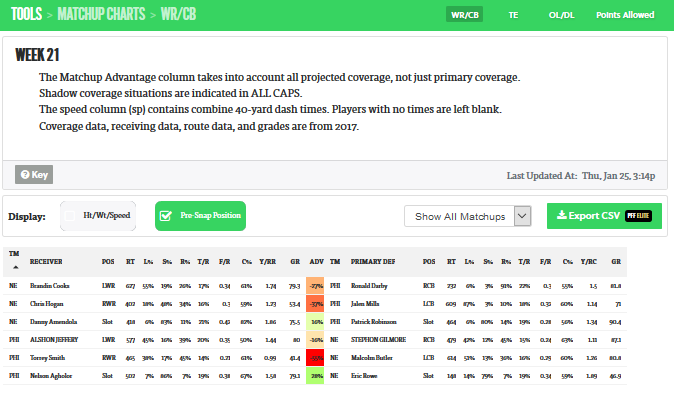 This chart lists each team’s three primary wide receivers and provides their projected cornerback coverage in a given week. This chart includes height, weight, 40-yard-dash time, targets per route run, fantasy points per route run, and grades for all wide receivers and cornerbacks in a given week. In Week 12, for instance, we rightfully said Jones had the single best cornerback matchup of the week, running the vast majority of his routes against a weighted combination of Brent Grimes, Robert McClain, and Ryan Smith. This chart has been immensely valuable to me as a DFS player and in making start/sit decisions between wide receivers in season-long leagues. You will also gain access to our Shadow Matrix, which includes all cornerback shadow games throughout the season (and how those cornerbacks and wide receivers fared in these games), as well as projected shadows in any given week. Our Tight End Matchup Chart and OL/DL Matchup Chart are similar to the WR vs. CB Chart. The Tight End Matchup Chart lets you know which defender will be in primary coverage against your tight end in any given week and how soft or tough that matchup might be. The OL/DL Matchup Chart looks at the advantage or disadvantage an offensive line might have against an opposing defensive line from both a run game (yards before contact) and pass game (pressure rate) perspective. Our Fantasy Points Allowed Matchup Chart is exactly what it sounds like, measuring the strength of any given matchup by fantasy points allowed for quarterbacks, running backs, wide receivers, and tight ends. 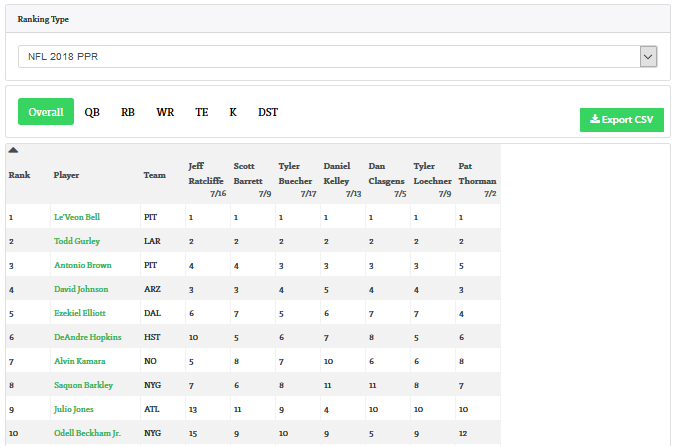 You will also gain access to our projected boxscores for both players and teams in any given week. I’ll use this frequently for DFS, in contrast to betting totals and prop lines, in an attempt to identify players or games we think might be flying under the radar in a specific week. Our Fantasy Depth Chart and Handcuff Index get updated weekly and let you know which players are a team’s starters, who will be the next man up in case of an injury, and which handcuffs are still worth holding onto in season-long leagues. With an Elite subscription you will gain access to our private Facebook group (NFL and/or Fantasy). PFF Fantasy staff members host regular live streams to answer questions from subscribers and our staff members will frequently post exclusive content within this group. Members can also post questions at any time and those questions will receive feedback from the PFF staff as well as from other members within the group. Have you ever felt like the odds are stacked against you in daily fantasy football? In cash games, are you unknowingly taking head-to-head matchups against DFS professionals who do this as their main source of income? In tournaments, do you feel outmatched up against the guy who is entering over 100 unique computer-generated lineups, while you’re stuck doing everything by hand? Do you want to know the top value plays at each position based on the industry’s most highly regarded fantasy projections? If so, our lineup optimizer is here to help. Our lineup optimizer sorts players by value and projection and uses those projections to help you build the best DFS lineup (or 100 lineups) that week. Our lineup optimizer is available for all slates on each of the three major DFS sites (DraftKings, FanDuel, and Yahoo!). Okay, now here’s where things really get good. It’s almost impossible to overstate just how valuable our premium stats are to me as a football fan, fantasy analyst, and fantasy player. 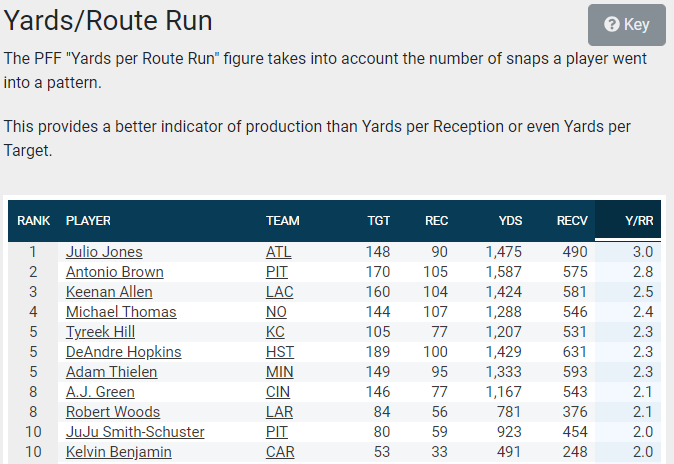 The above chart lists the top-20 wide receivers by yards per route run last year (min. 50 targets). Yards per route run is the most valuable efficiency metric I’ve ever come across for wide receivers and is just one of many valuable PFF-exclusive metrics we have to offer as part of our Premium Stats. Here are some articles I’ve written this offseason explaining the (fantasy) utility of some of these metrics with accompanying analysis: deep passing efficiency for wide receivers and quarterbacks, pass blocking efficiency for tight ends and running backs, drop rate, passer rating when under pressure, play-action passer rating, WR Rating, and yards per route run. Premium Stats 2.0 includes everything we offered last year but has added scaled team grades (offense, passing, pass blocking, receiving, running, run blocking, defense, run defense, tackling, pass rush, coverage, and special teams). 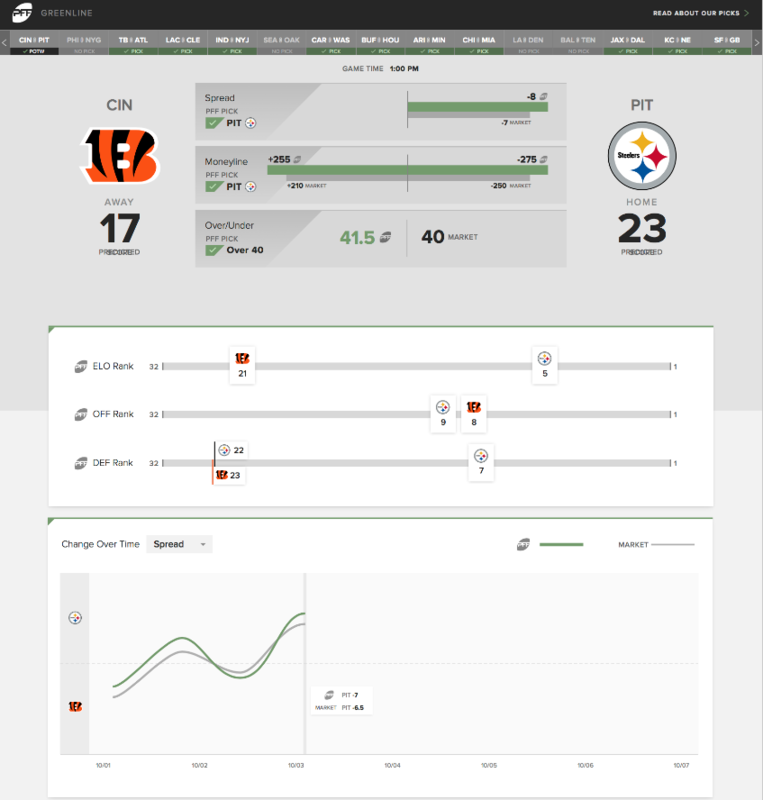 Our newest product, PFF Greenline, is a pick’em service aimed at bettors looking for a serious edge against sportsbooks. 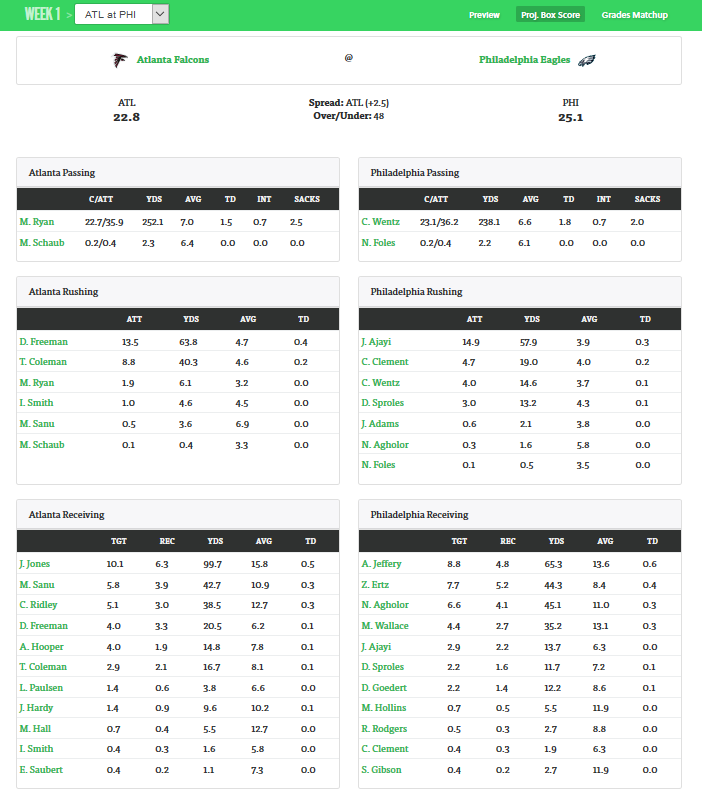 PFF Greenline will also provide a live look at all games updated in real time with the PFF prediction for the spread, moneyline, and over/under. This will be an opportunity for bettors to make some serious cash in the 2018 season as well as learning the “how” and “why” behind our predictions. For perspective, the masterminds behind PFF Greenline, Eric Eager and George Chahrouri, went a combined 24-8-1 on their “Lock of the Week” picks last season. For a more complete breakdown as to what PFF Greenline is, you can read more here. The bottom line is, PFF delivers an incredible amount of fantasy analytics and data-driven advice to give you the advantage over your competition. Join PFF EDGE or PFF ELITE today.